Personality: Yumi is quiet, and more to herself if anything. She's quite boyish, and would rather hang with boys, instead of girls. She expresses herself through her artwork and clothing style, and dislikes compliments. She loves hanging out with her sisters and friends, and enjoys conversation. Clan Symbol: A crescent moon, with a full moon beside it. Special Jutsu(s): Crescent Moon, Moonlight Haze, Moonshine. 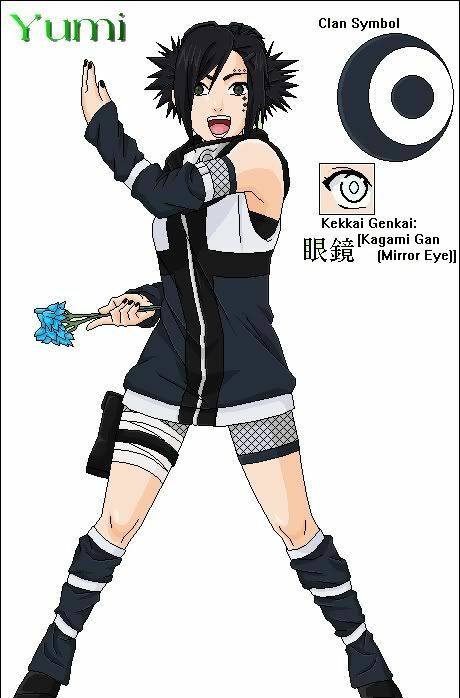 Kekkai Genkai: Her Kekkai Genkai, the Kagami Gan, or Mirror Eye, is much like Sasuke's and Neji's. Her vision becomes sharper and allows her to see parts of the future. She is also able to copy any move she sees, with only one watch. Likes: Flowers, reading, drawing, singing, being lazy. Dislikes: Annoying people, nosy people, rude and careless people, missions and being pushed to do something. History/Bio: Yumi was born in a large clan, known as the Luna clan. The Luna clan was famous for it's special Jutsu, and skilled ninja. Yumi was one of the few who learned the famous Moonshine Jutsu at a very young age. She mastered it quickly, transforming it into an even more powerful Jutsu. Her mother and Father were the least understanding of Kohaku, but her older and younger sisters understood her well, which was good for her. As a child, Yumi was teased a lot, and blamed for nearly everything. She hates to cry and show her weakness, which is her emotions. Yumi learned the Moonshine at 6, graduated from the academy, to become the kunoichi she is now, and is currently teamless.